By now, you probably know that I am very much into family photoshoots because the way I see it, my kids are growing up much too fast (which means the hubby and I are aging quickly too) and photography is one of the best ways in which I can capture some blissful, precious moments to remember for a lifetime. We've done collaborations with quite a handful of photography studios and while there are a couple of them whose end products that we really love, there is only one studio who towers above the rest if we have to pick our ultimate favourite. That will have to be Orange Studios. In fact, as a parenting blogger, I can say that Wini and Ryan, the husband and wife team behind Orange Studios, are one of my favourite people to work with over the past years. Unlike the pure blogger-client relationship that I've had with most of my sponsors, Orange Studios goes the extra mile to develop something special and I would call that friendship. I mean, they call us up for preparatory calls, they are easy-going, friendly and accommodating every time we show up at their studio, I have them on my WhatsApp and Facebook, they take the trouble to deliver products to us and at times throw in a surprise bonus gift, they even include a sincere, handwritten Thank You card every time which we've kept over the years. Yes, I do appreciate little things like this a lot. Pleasant, personable and professional - in my view, these are the qualities that make Orange Studios special. So, we've recently done our Maternity and Newborn photography sessions with them and I must say that we really love many of the photos which have been very well-received on my social media. In case you have not seen them yet, here's sharing some of the end results and also our experience during the photoshoot. For the preggie mums who are keen to go for photoshoots with your baby bump and newborn, the good news is there will be an Exclusive Special for all A Happy Mum readers. Read on to find out more! Even though this is my third pregnancy, I've never done a maternity photoshoot before so this was the first time I had to show my baby bump in front of the camera! Well, since there is a strong likelihood that it would be the last chance, I thought I should make the most of it and capture some precious shots of the preggie me. For the shoot, the backdrops were kept simple - white, black, grey and a brick wall which I personally really like. One thing I like about Orange Studios is that they encourage clients to be as natural as possible, thus they would recommend straightforward, simple outfits and light make-up. If you are worried about not having the right clothes to wear, you are not alone! At first, I was also apprehensive about outfits and was unsure of what to wear so as to look best. Before the shoot, Orange Studios sent me an email with some preparatory tips which helped to put me at ease. According to them, it is best to pick out some simple, solid coloured clothes so that the focus is on you. Try to avoid clothing with distractions or patterns like stripes, polka dots, checks, big logos etc. Also, since preggies have some nice curves to show off at this time, which is around 33-36 weeks of pregnancy, we should choose fabrics which adhere to body shape so that the baby bump is more visible. Some examples of suitable outfits include long, flowy dresses or skirts, tube tops or dresses or button-up shirt with leggings or jeans. Whatever you choose, comfort is of utmost priority so make sure you feel good and relaxed in it for the whole shoot, which lasts approximately one hour. For me, I chose to go with a dress and just tube tops matched with leggings or jeans (actually, I wore the hubby's jeans!). Thanks to Impression Lingerie for the black and white tube tops which felt absolutely comfortable and showed off the bump perfectly (you can read my review as well as tips for maternity shopping here)! As for make-up, keep it simple and not over the top. The same applies for hairdo. While I don't think I look too presentable with my bare face, I also believe that natural shots are the best looking and most lasting. After all, a pregnant woman radiates beauty and shines from within, don't you think so? 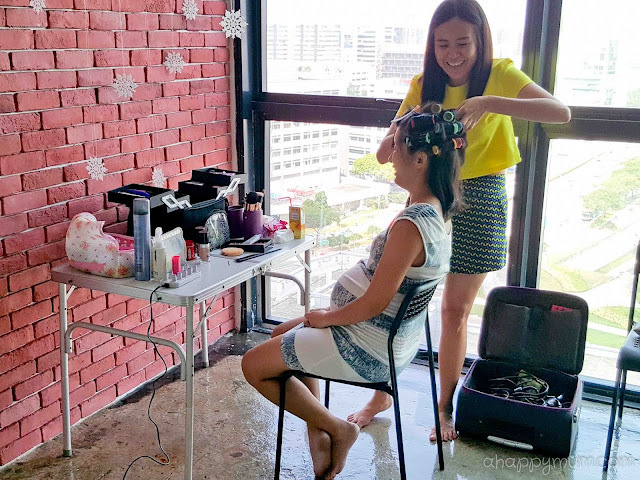 For the maternity shoot, I was lucky to have my hair and make-up provided by Jennifer (those looking for a freelance hair and makeup artist can contact her at 9792 0058), who is also a fellow mum. I like that we had common topics to talk about and she was really sweet, gentle and careful the whole time. 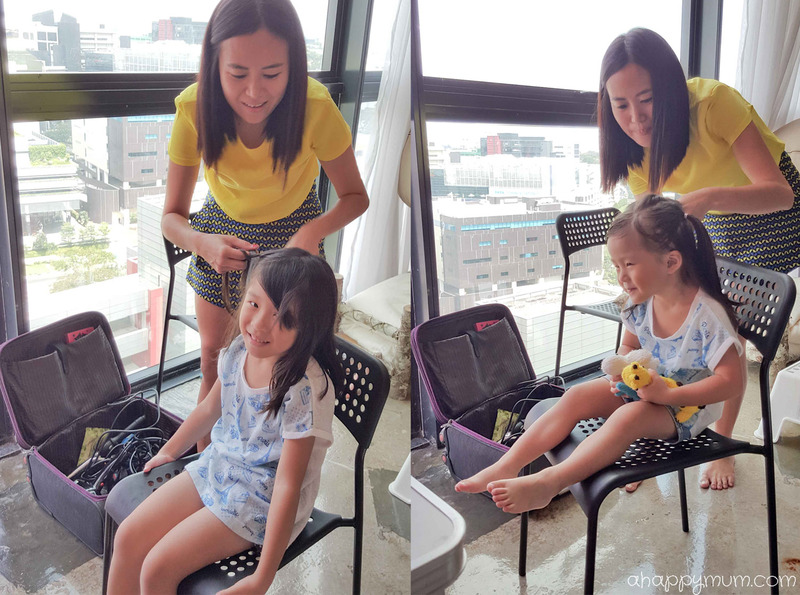 Without being too elaborate, she helped to doll me up and why, she even did the girls' hair, much to their delight! One thing I really like about Ryan and Wini is that they know the importance of 'warming up' the little ones and helping them to ease into the environment. And they really put time, effort and sincerity into getting to know them, talking to them and making them feel more comfortable. It doesn't matter that my girls have been to several photoshoots and even done commercial filming, every time we go for a shoot or arrive in an unfamiliar environment, they still tend to be shy and quiet at first. So it really helps a great deal when the photographer is affable, approachable and best of all, has a love for kids. He was also very enthusiastic when capturing the shots and this enthusiasm in turn spilled onto the kids, who very quickly settled down and tried to cooperate as best as they could. Ryan would try out various poses just to see which ones made the kids feel most comfortable in and he was very flexible in that, never forcing them to comply and thinking of alternatives when one way didn't work. When our smiles started to look too posed and unnatural, he would also come up with ways to make everyone relax and have a good laugh so that he could capture a more spontaneous side of us. This was something I really appreciated because it can be so hard to get a family picture where everyone is smiling from within and beaming with joy, don't you think so? As for Wini, she is meticulous and has an eye for details, for instance she would spot any hair that is out of place, feet that are in awkward position or skirts which have pulled too high up. She would then help to adjust gently with care so that everything would be spot on. When I did my solo shots where I had to tiptoe on one leg or sit in a yogalike position, she was also very understanding and at intervals, asked if I was feeling okay and told me I could take a break whenever I had to. In short, they placed our needs and comfort as top priority, not just their wants in getting that perfect shot. That was the reason why we truly enjoyed every photoshoot session from start to end. Now, if I have to talk about how the photos turned out, I think pictures speak louder than words so here are some of my favourites to share with you. The moment I laid my eyes on these pictures, I can only say that I was so thankful to have done this! I love my solo shots, I love our couple shots, and I love, love, love our family shots! Absolutely precious, aren't they? If you can sense my anticipation and how much I was looking forward to meeting my baby boy from the pictures above, then you probably can guess how elated I was when I knew that, for the first time, we were going to do a newborn photoshoot. Wait, it's not that I didn't take pictures of Angel and Ariel when they were born, I did that aplenty but it's just that I'm totally unprofessional when it comes to photography. So, I was glad the baby had a chance to do it in a proper studio and guess what, siblings and parents can join in too! Woohoo! Now, since the shoot takes place when the baby is around 1-2 weeks old and we know how precious these tiny beings are to every parent, the top concern would be safety. Some of us might worry about how the baby will be handled, whether he/she can survive a 3-4 hours long photoshoot, what to do if he/she is starving or poos halfway through etc. If you are at Orange Studios, I can only tell you to rest assured that your baby is in good hands and will be well taken care of. 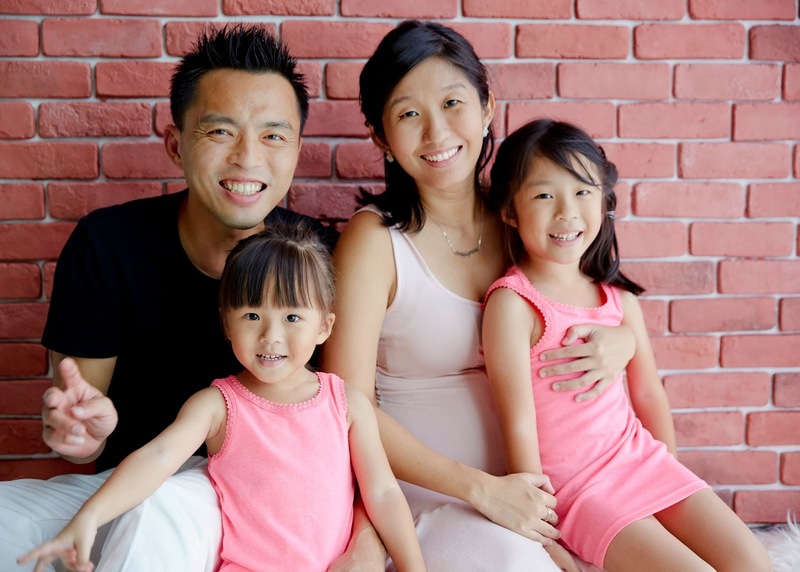 Both Ryan and Wini have attended overseas professional courses and training on Newborn photography, including safety for babies and parents during photoshoot sessions - which is always their top priority. Every baby will be handled with utmost care and lots of love during the session. I have to say that they are even gentler with my baby than me, which says a lot! From just the setup of the studio, which is located in Oxley Bizhub in Ubi, it is evident that our needs are taken care of. Changing room, toilet, kitchenette, dining table, wash up area - and there is even a nursing room set up where mums can feel free to feed their babies and older kids can take a break there while waiting. You bet the girls were happy that they got to watch cartoons when they were done with the siblings and family shots! The reason why newborn shoots take 3-4 hours is because they take into account the time for feeding, calming, soothing, cuddling, posing, changing and cleaning. Yes, there is a high chance that the baby will pee or poo several times during the shoot and since he/she will be naked on some occasions, don't be taken aback if poo squirts over you, which was what happened to me. I realised that Ryan and Wini seemed to be very used to this scenario and they immediately sprang into action to help clean up with the wet wipes they had put on standby. No fuss at all. I was also amazed by how they managed to swaddle Asher up time after time and he actually looked so snug and cosy. Wini was very cautious and gentle in changing him, letting him lay down or placing his feet or hands in a particular pose. Why, they even turned on a baby shusher (a device that makes rhythmic shushing noises to soothe and calm a baby) and let's just say it was the first time the hubby and I even heard of such a thing. Well, anything to make our baby feel happy and comfortable! If you are wondering about whether a newborn baby can handle the harsh lighting of a studio photoshoot, Orange Studios has the same consideration and that is why they recommend for the shoot to begin in the morning so that they can make use of natural lighting and the soft sunlight that shines in through the window. There were absolutely no flares or flashes in our baby's eyes and he ended up sleeping for more than half of the shoot. I was secretly happy that he was awake for the other half as that meant we captured both kinds of expressions! Another thing I like about Orange Studios is that they emphasize on personalisation so they encourage you to bring along your own props - meaningful things that tell your unique family story. Did you read our first review of them where we brought along nearly half the house, including things like paintings, books, a toy piano and bicycle? If you have not, you can do so here. That was one of the first photoshoots we did and our colourful family picture still hangs proudly on a canvas in my living room. So for Asher's photoshoot, we thought it would be nice to photograph him with the Jubilee Baby gift box since that was something unique and meaningful for our boy. He was a little fussy when we did this and after Ryan and Wini gave me time to feed him, again, in the nursing room, they actually asked if I wanted to try again though our time was almost up. How sweet and kind, right? And so we did, and they succeeded in placing him so snugly in the box while he was sleeping. That had to be one of the most memorable shots we'll ever have of our SG50 baby. Here are some of our favourite shots from the newborn session. Enjoy viewing! The sibling shots of the sisters kissing, cuddling and caring for their little brother - Pure. The family shots of us as a happy family and our couple shots with our new arrival - Precious. The solo shots of our baby boy and how he has captured our hearts - Priceless. Now, although I'm thankful for digital technology and I cannot survive without soft copies of these precious photos, I also believe in turning them into print so that you have something tangible to hold and this can become a precious heirloom for generations to come. We received a 20-page leather album which contained shots from both the maternity and newborn sessions. The print quality is one of the best we've seen and I love how natural the shots turn out to be. Thanks to Ryan and Wini who were so kind as to rush this out, we were able to display the album at Asher's full month party. I can already imagine that years later, we will be sitting on the couch, talking about each picture and reminiscing the good old times with our children. And possibly grandchildren. I was also pleasantly surprised to see these wallet size prints and the first thing I did was to laminate and cut them out. Besides placing our favourites in our own wallets, my idea was to turn some of them into magnets and give them away to our close family members. Imagine how delighted my grandma will be to see this on her fridge everyday! As for Angel and Ariel, the first thing they did was to choose their favourites and put them in their school bags too. Awww. 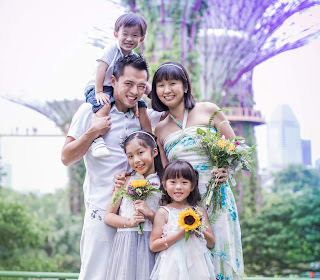 Here's a sincere and big THANK YOU to Orange Studios for all the wonderful moments you have captured for our family! Good things are worth sharing, we sure hope more families will come to you so that they can experience the same joy that we did! Orange Studios specialises in creating portrait wall art (e.g. canvas prints, glass frames) and albums. They strongly believe in tangible printed photographs which can be passed on to future generations as a family heirloom with pride. For more information, visit http://orangestudios.sg/. The session fee for a Maternity studio portraiture is at $150. - Husband and children may join in, without additional charges. The session fee for a Newborn studio portraiture is at $250. - Parents, siblings and grandparents may join in, without additional charges. 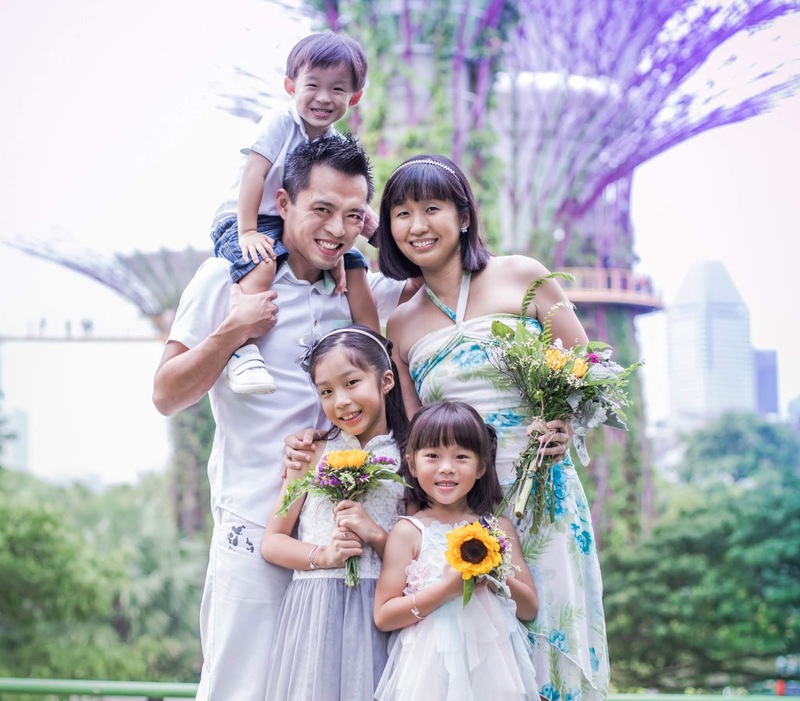 The session fee includes a pre-photoshoot preparatory/consultation call and a customised studio portraiture session. Session fee does not include products or digital files. Products and/or digital files may be purchased via “Create Your Own Collection” or “A La Carte“. A brief guideline on pricing can be found at http://orangestudios.sg/pricing/. For more details, please call Orange Studios at 8606 6950. Note that there is a limited number of Newborn sessions each month so that clients receive the best service and experience, so book early to ensure availability. To making your booking, email contact@orangestudios.sg or call 8606 6950. 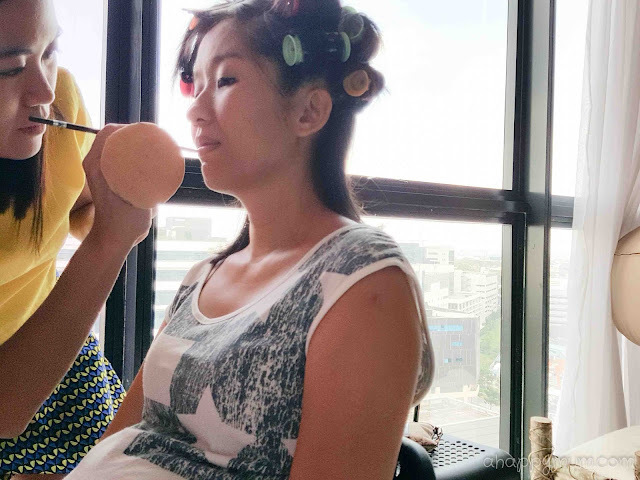 Disclosure: This is a sponsored post and we were invited by Orange Studios to review their Maternity and Newborn photoshoot packages. All opinions are our own. love all the photos my dear!! Such a beautiful family and yes, it's really something special when the brands become our special friends and have more than a client/blogger relationship. Congrats once again on the birth of your beautiful boy! Thanks so much, Ai! Yes, I feel so happy and lucky when I meet sponsors like that! Really very rare! :) thanks for the wishes!